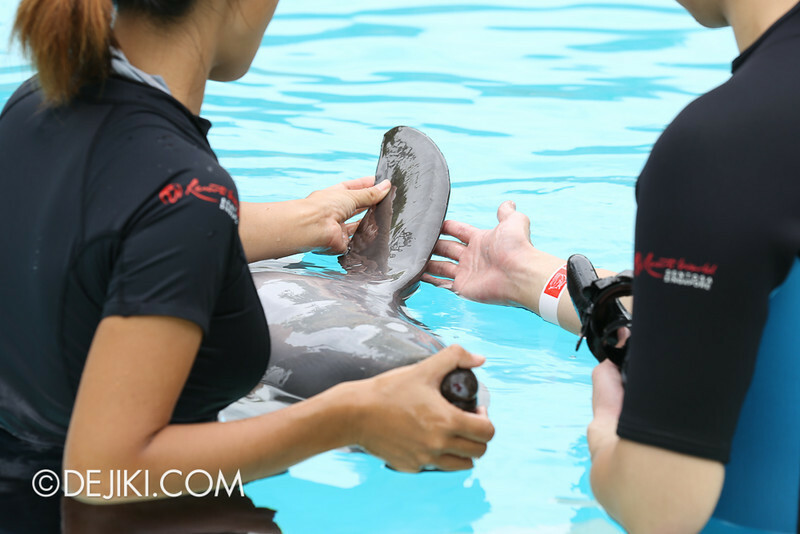 Resorts World Sentosa’s Marine Life Park offers dolphin interaction programmes at their newly opened Dolphin Island. This attraction provides visitors with many opportunities to meet and interact with the park’s famous Indo-Pacific bottlenose dolphins. 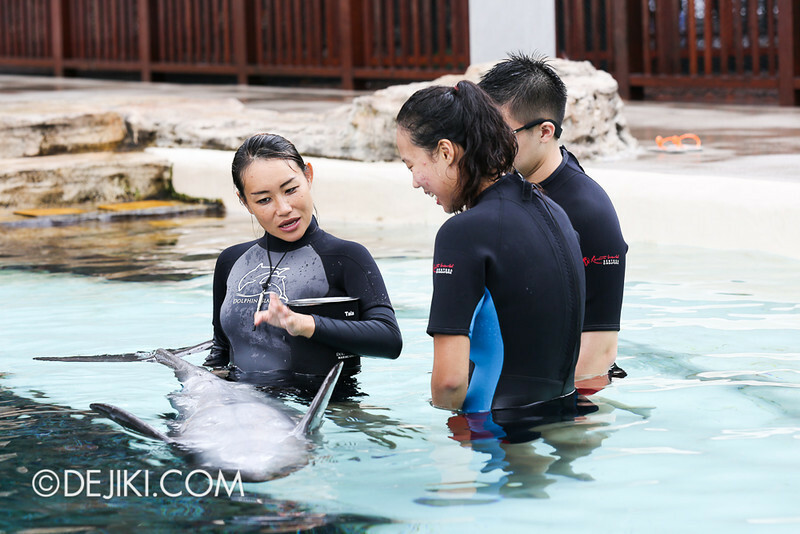 I was invited to experience Trainer For A Day, a six-hour programme at Dolphin Island. This is perhaps the “ultimate” package (and priced to match), as it not only includes several encounters with dolphins, but also hands-on experiences of a dolphin trainer’s role at the park. 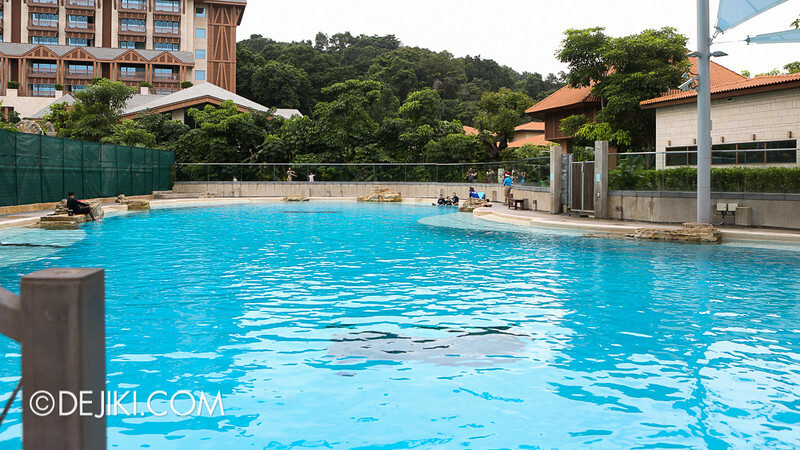 Other programmes offered are much shorter in duration (running between 30 to 60 minutes) and are hence more suited as add-ons for a day at Adventure Cove Waterpark. Trainer For A Day is not an opportunity to take over one of Marine Life Park’s dolphin trainers, play with dolphins all day and swim off into the sunset. It is however, an intensive session of learning about dolphins and interacting with them, through first-hand experience of working with dolphin trainers. 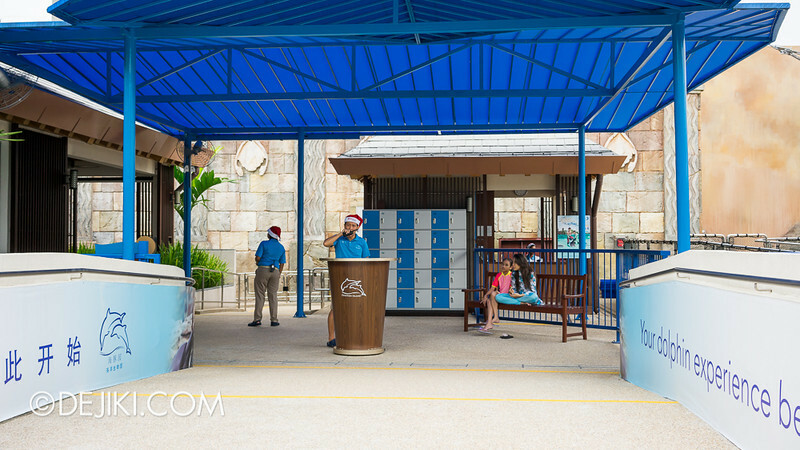 After checking in at Dolphin Island’s entrance inside Adventure Cove Waterpark (ACW), I was asked to deposit my bag into the lockers. No bags or loose items are allowed in Dolphin Island. From this point onwards, park visitors are expected to be in their swimwear. Wetsuits are provided at the park. Given its duration, Trainer For A Day is held once a day from 10:00AM till 4:00PM. The actual schedule is very flexible and varies, depending on the needs of the dolphins and other programmes running concurrently each day. I participated in this programme with Sally from mothership.sg. 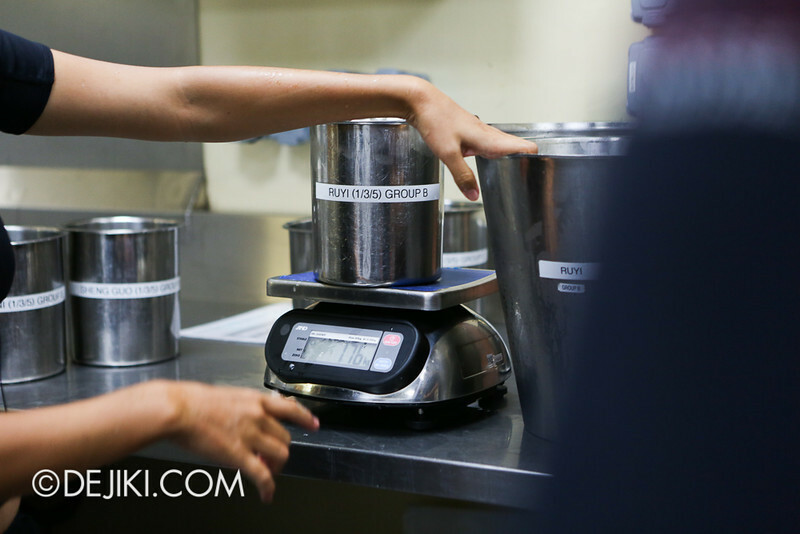 During the first half of Trainer For A Day, I got to experience food preparation, dolphin husbandry and peek at other guests participating in Dolphin Trek. Kiyo, a dolphin trainer who has worked with the dolphins for years, hosted us throughout the day. Over here, she showed us the dolphins’ daily food intake. Food is prepared daily, and that was our first task as a Dolphin Trainer Assistant, I guess. The park brings in frozen fish and squid from overseas regularly. 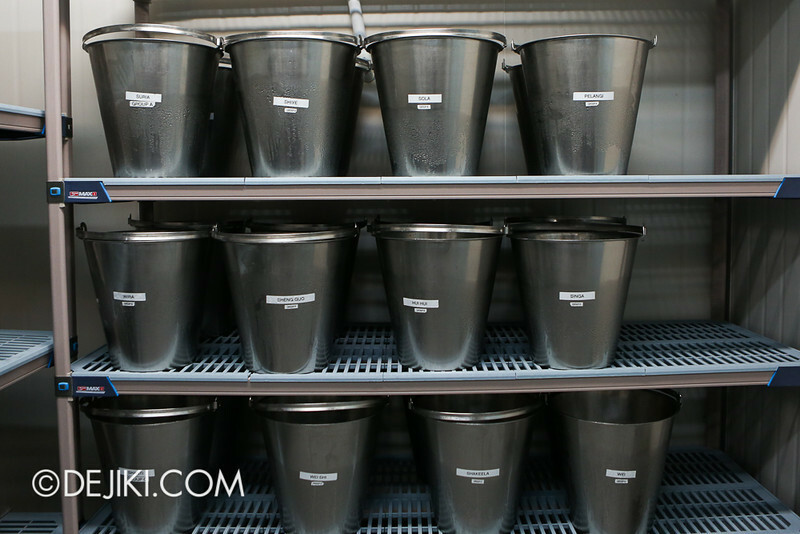 Also, as we sort the food into smaller buckets, Kiyo told us to discard anything that doesn’t look good or “intact”. We also had to throw away anything that falls on the floor or table. Only the best for the dolphins! 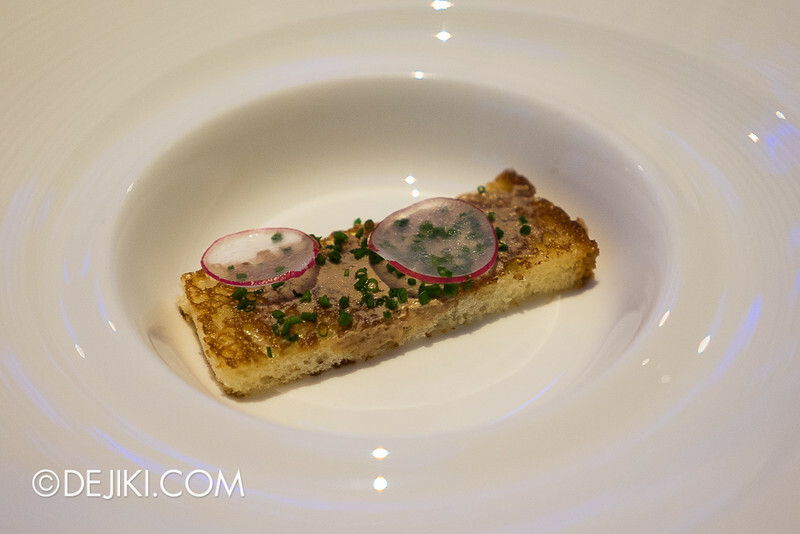 If you’ve never touched raw fish before, you’ll have ample chances here. Kiyo then brought us to other sections of Dolphin Island. If you’ve kept up with my updates, we walked along #10 to #11. #10, being a long trench, is the dolphins’ favourite section. The “Pool #11” is actually the VIP Lagoon used for Dolphin VIP programmes. We then went back to the main section of Dolphin Island for the next segment: Dolphin Husbandry. Dolphin Husbandry is not about breeding or marrying dolphins. It is actually a series of tasks to track and manage the health of dolphins. 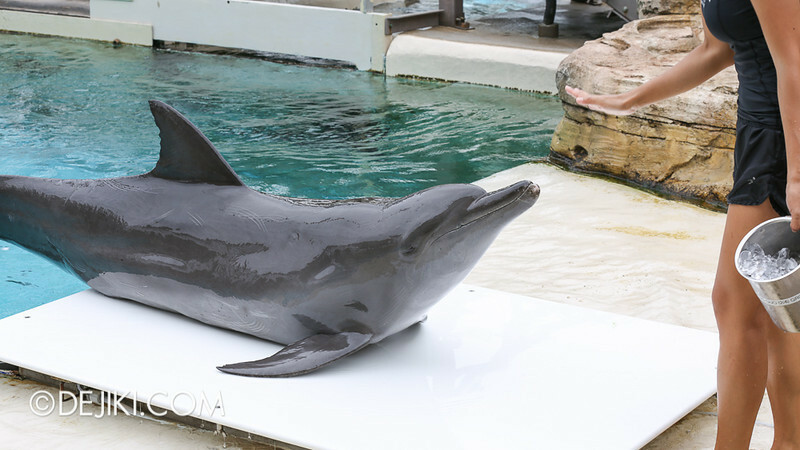 The park uses an animal health management application by OERCA to track the health of the dolphins. The app is also used to record other daily activities like feeding and training. 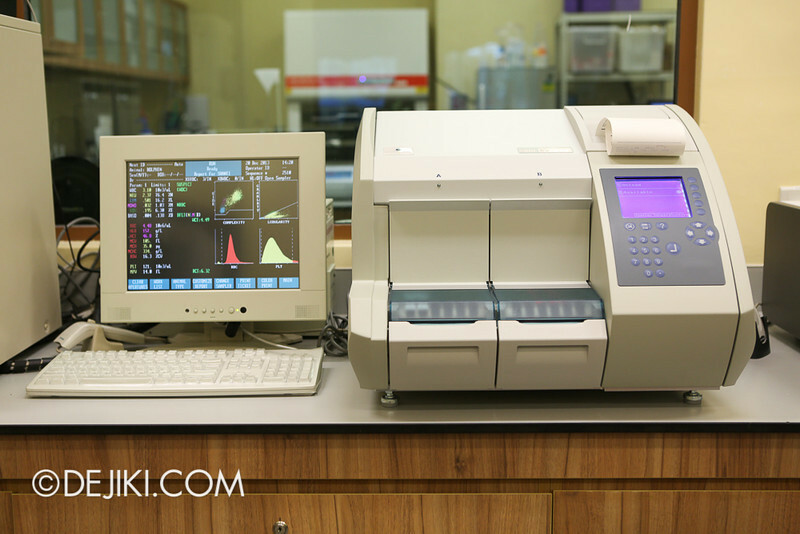 Apart from physical checks, samples are taken regularly from the dolphins for lab analysis. We were then shown the teeth of a dolphin – not used for chewing fish, but to bite and grab them. This white platform here is actually a huge weighing scale used to measure a dolphin’s weight. We then took a break and went for lunch at Ocean Restaurant. That’s right, the one that faces the Open Ocean habitat at S.E.A. Aquarium. 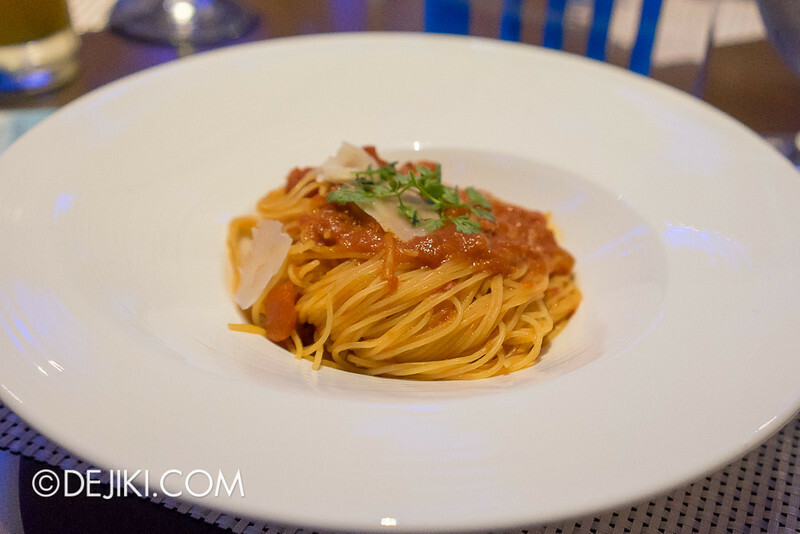 This three-course set lunch is part of Trainer For A Day. 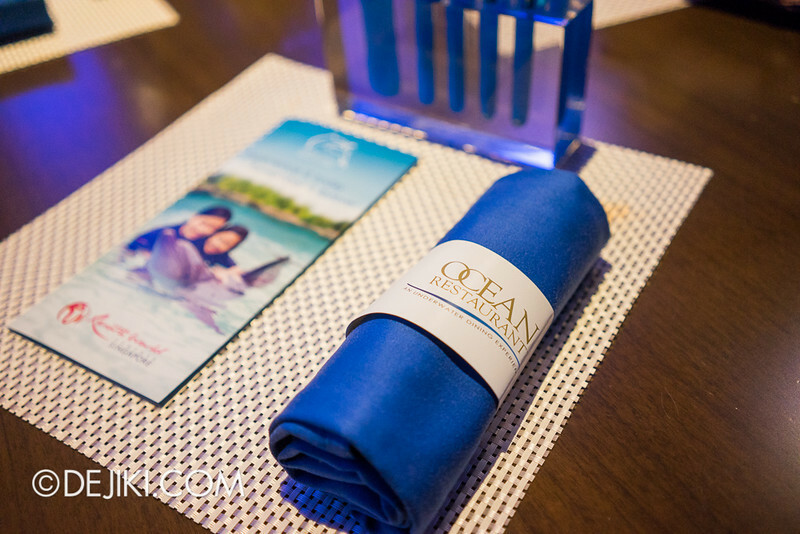 The other Dolphin Interaction programmes also include a meal, but only at The Bay Restaurant (in Adventure Cove Waterpark). After lunch, we had a brief tour around S.E.A. 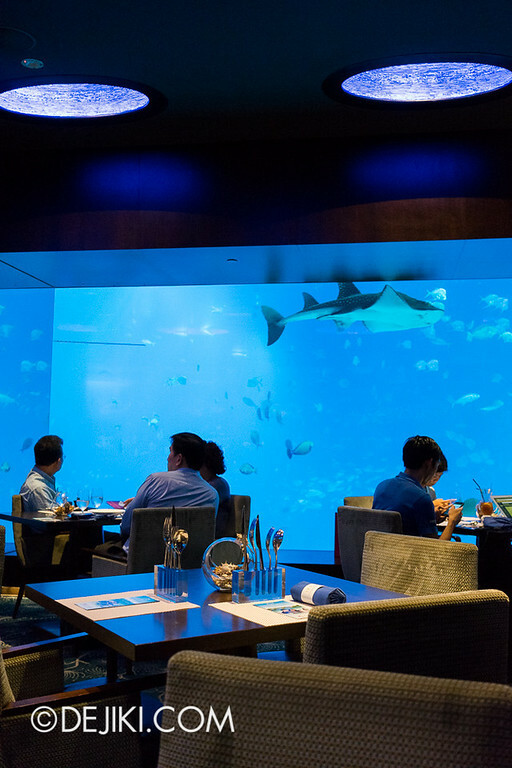 Aquarium, so that we could see dolphins from the window there. We then sneaked a peek at the Open Ocean Habitat… from the (rather secret) backstage area above the massive tank, to be precise. Moving on, we returned to Dolphin Island for a brief visit to the healthcare facility. 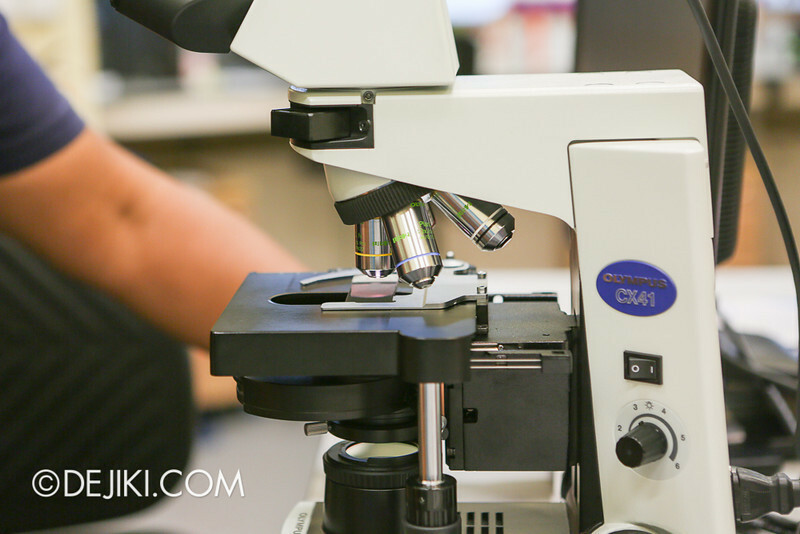 The samples taken from the dolphins are examined here. The park has to keep doing this regularly as dolphins are able to mask their ailments. We then went back out again to the dolphin lagoons. The afternoon was more interactive we participated in the Dolphin Adventurer, which is included in Trainer for A Day. 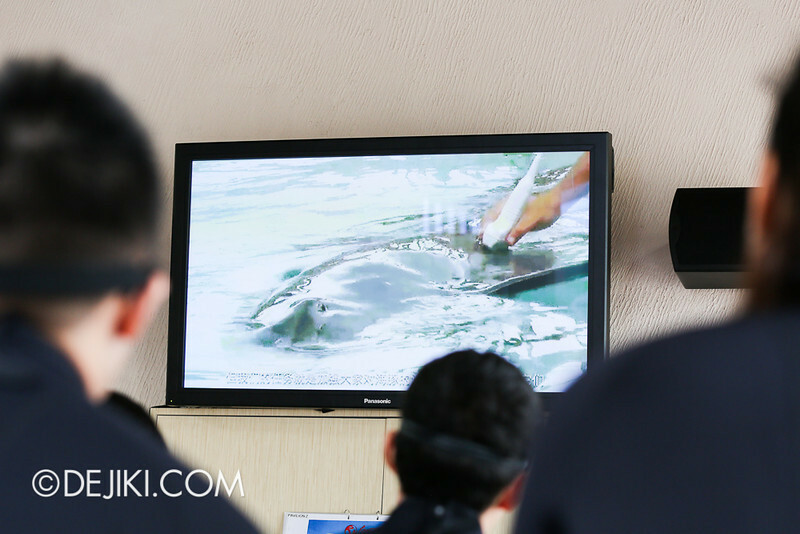 Together with other guests, we sat through an introductory video about dolphins and other safety guidelines. Then came the highlight of Adventurer – Dolphin Foot Push. Lying on a kickboard, two dolphins pushed me from across a large lagoon. It’s a pretty high-speed ride that lasted mere seconds, although mine had “bonus time” because one of the dolphins swam away (while the other was still pushing me) so it became more like Dolphin Tea Cups! Funny moment. I was taken by surprise when Kiyo told me to swim out to the deep section of the pool. The later half of this session was close encounters with the dolphins, with them “standing” upright directly in front. Thankfully one of the Dolphin Island crew member ran to get a life jacket. Being out with the dolphins make great photo opportunities, and it was quickly followed with more: those standard kissing and hugging dolphin pictures. You’ll get them all here. Then came the educational segment of the session: Among other interesting facts about dolphins, Kiyo explained to us that the dolphin’s colouration works a natural camouflage in the ocean. These Indo-Pacific dolphins have dark grey backs but their bellies are much lighter in colour, which makes them blend into the waters when viewed at different angles. During this session, we had LOTS of opportunities to touch the dolphins. Fun Fact: While dolphins are marine mammals, they don’t have hair. They shed their skin all the time to reduce drag in the water, allowing them to swim very swiftly. The dolphin’s skin has a smooth, rubbery texture with a light grain. Apart from tooth marks (caused by dolphins biting one another) which resemble jagged parallel lines, the skin felt very smooth. Kiyo kept the best parts of the day for the end. 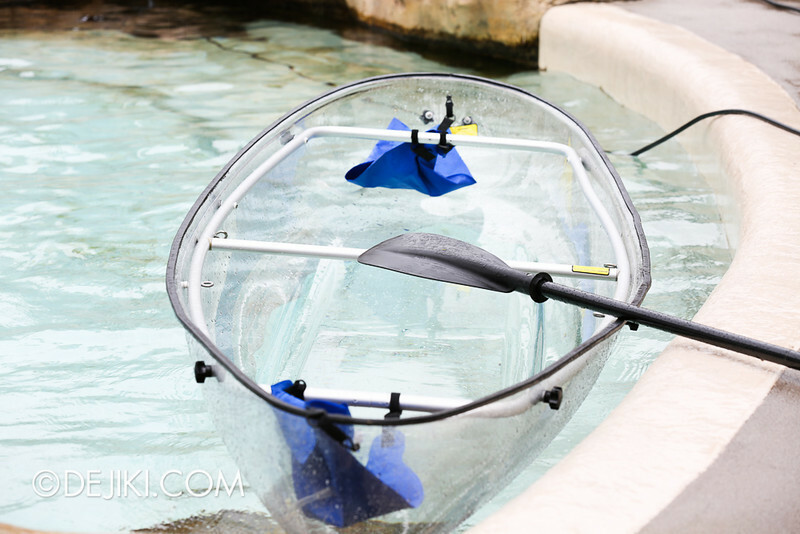 After Dolphin Adventurer, it’s a short ride on a transparent kayak. It was certainly magical to see four dolphins swimming closely, right below the kayak. And then – they popped out of the water, too. The last bit was a demonstration of dolphin training. 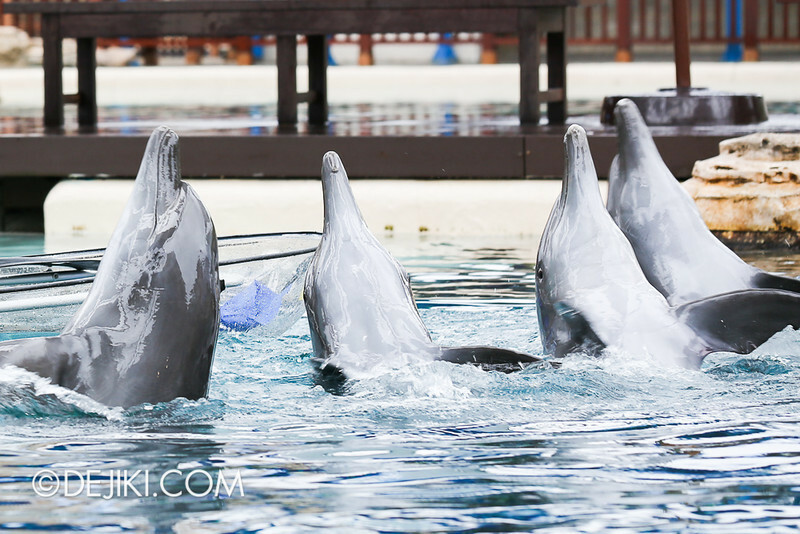 The park uses positive reinforcement when training dolphins. Kiyo showed us hand signals and we followed. A dolphin (Suria if I’m not mistaken) responded to our signals and was capable of executing all the moves. Of course, we had to feed Suria numerous fish for her fantastic performance. Trainer For A Day was an enriching experience at Dolphin Island, providing insights on Dolphin Island’s daily operations and the many responsibilities of its trainers. It is a tall order to be a trainer – you need to have a lot of patience and passion to work with dolphins. 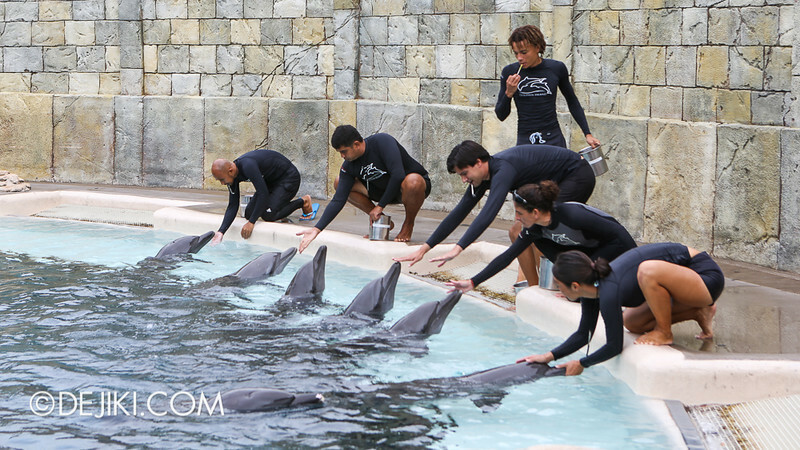 They have also demonstrated that they give their best care for the dolphins. 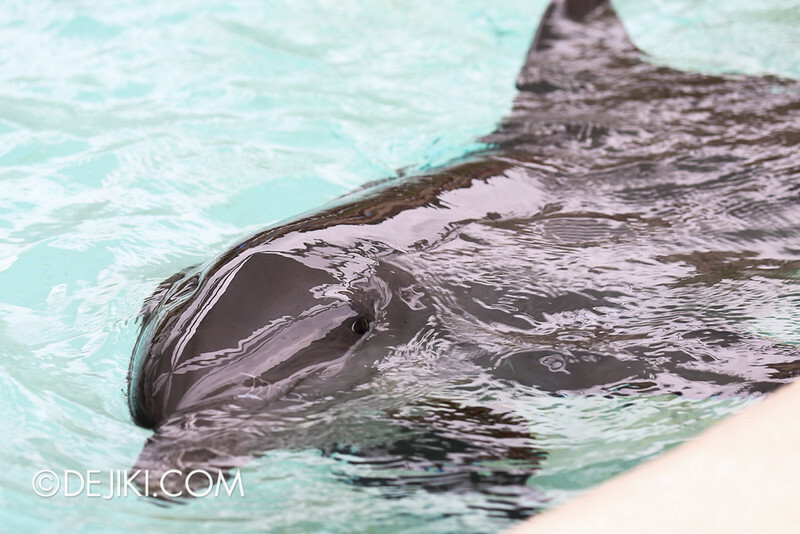 Throughout the day, Kiyo shared countless facts about dolphins and kept prompting us to ask her questions. After we ran out of questions to ask, she began to test us instead! The trainers I met at Dolphin Island showed their knowledge in not just marine mammals in general, but even characteristics specific to each dolphin. Frankly speaking, the most jaw-dropping thing is how they could identify the dolphins, individually. I felt conflicted with some parts of the programme, especially the Dolphin Adventurer segment. While it was fun (and is part of the trainer’s job to facilitate that), upon reflection it is seemed to be just entertainment. The following moment spent learning about dolphins was more palatable. The last segment on trainer hand signals was also impressive, but I can’t help but wonder if it was necessary to train dolphins to jump on command. Perhaps the park’s big challenge for this attraction is striking a balance of educational segments with interaction sessions that are memorable. Inadvertently, when catering for a mass audience, it has to be somewhat entertaining. This programme is quite lengthy (well, it is trainer for a day after all) at six hours, but I saw and did so much that the time really just went by quickly. The day was packed with a lot of walking around Dolphin Island’s lagoons and getting in and out of the water many times. 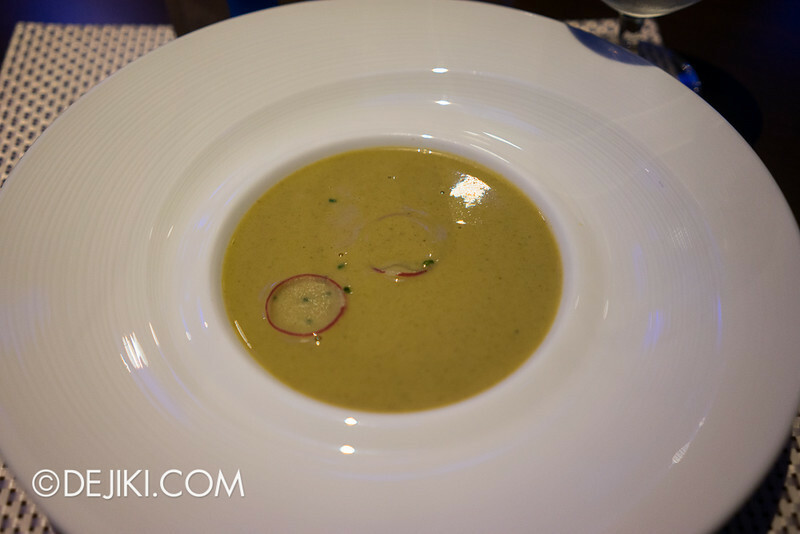 If you cut out lunch hour, it’s about 4.5+ hours at the Dolphin Island. 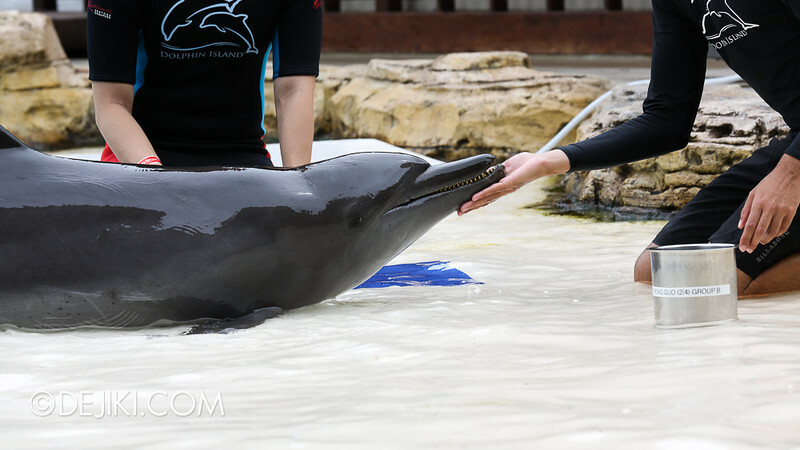 In short: With lots to learn and love, Dolphin Island’s Trainer For a Day provides a highly interactive and memorable day out at Marine Life Park’s dolphin lagoons. If you have considered booking the other dolphin interaction programmes, I would strongly recommend saving up for Trainer for a Day instead, since it offers so much more. Trainer For a Day is available daily. At time of writing, the programme runs with a limit of 5 participants per session, and only one six-hour session is held per day from 10:00AM till 4:00PM. Advance reservations are required for this programme and can be done at Adventure Cove Waterpark or through the Dolphin Island Enquiry Page or by calling 6577 8888. Adventure Cove Waterpark (ACW) Annual Passholders can enjoy a 25% discount on all Dolphin Interaction Programmes. This brings the price down to $373.50 (adult) and $366.60 (child/senior). RWS Invites members can enjoy a 20% discount on all Dolphin Interaction Programmes till 31st March 2014. This brings the price down to $398.40 (adult) and $390.40 (child/senior). This programme is suitable for non-swimmers (Please grab a life jacket. I totally forgot about it until I had to swim into the deeper section). You might not experience everything that I’ve mentioned, and possibly not in the same order. You (or accompanying children) have to be at least 122 tall to participate. If you are below 21 years old, a parent or guardian must be present to authorise participation. You can’t bring anything but the clothes on your back and footwear into Dolphin Island. Since you can’t bring anything in, your only way to get photos is via the park’s photography service. The park’s photographers will follow you throughout the day. Photos start from $25 for a 6R print, although you can also get a CD of jpegs. The CDs start from $125 each (for 50 photos). Since I did not buy the CD, I am not sure about the quality of photographs. However, you can look through all the pictures taken and decide which photos to keep. Please refer to the Policies and Restrictions document for Dolphin Island. 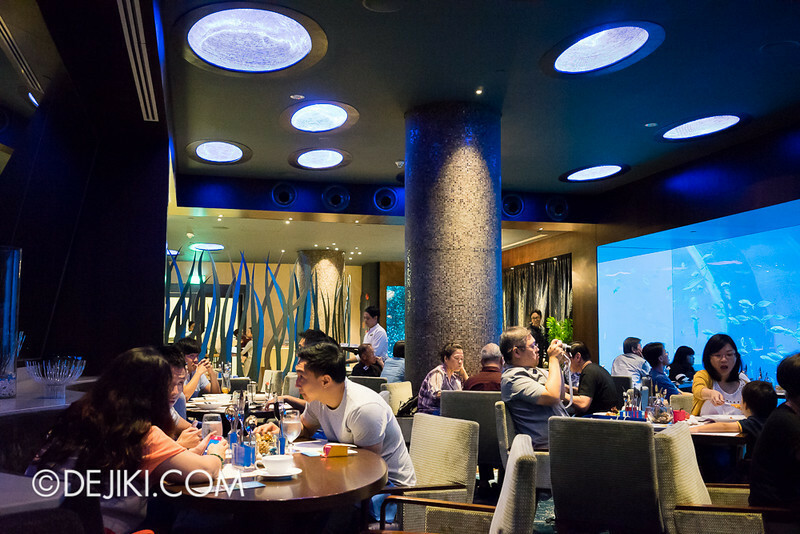 Thanks to Resorts World Sentosa for inviting Dejiki.com to visit Dolphin Island. 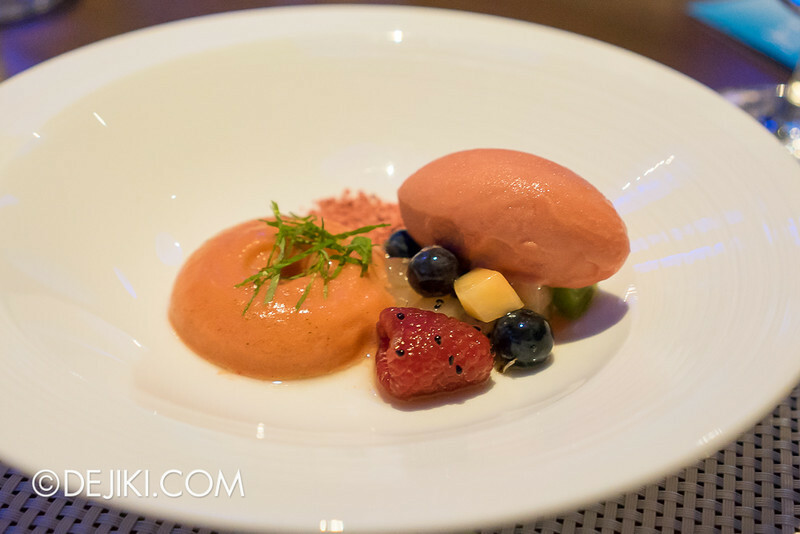 Some photographs used in this article are provided by Resorts World Sentosa. Thanks for sharing the info about the Picture CD. What are your thoughts about the Dolphin Discovery programme? I think the Dolphin Discovery program should be more then enough to satisfy most casual visitors! We have the chance to hug and kiss the dolphin, and did some basic interactions with “Wei”, the largest male dolphin in the park. Anything more in-depth, it will have to be your Trainer for a Day program!